Sad though it may be, I have devoted my life to discovering healthy snacks to keep hunger pangs at bay. In my current state of being manically health conscious, I have covered every corner of snack-dom. From chocolatey rice cakes through to dried apple crisps (Snapz- delicious! ), I have sampled almost every low calorie treat around. I am hoping to try, in the next week or so, the Itsu dried seaweed, but until then I will make do and mend with tasty Metcalfes Wasabi popcorn and, my true vice, frozen yoghurt. Moving down to London from Edinburgh has been a revelation in many respects. The shopping is far superior (apologies, Edinburgh, I still love you! ), the nightclubs are out of this world and the cuisine on offer is wonderfully expansive. Another noteworthy discovery has to be the numerous frozen yoghurt parlours around the capital. Having always been a little bit addicted to ice cream (see HERE), frozen yoghurt was always going to appeal to me. It offers all the indulgence of a luscious pot of Haagen Dazs, but without all those pesky calories. I am not insinuating that frozen yoghurt has negligible calories, or will make you any slimmer (sorry! ), but it is oodles lighter than your standard Magnum (*cough* 260 calories *cough*). It is also a great way to cool down or a refreshing way to treat yourself after a long day. My first taste of fro-yo in London came courtesy of Snog. It was, of course, absolutely delicious and had me hooked. A variety of flavours are available in Snog, alongside some decadent toppings to boot (I loved the winter toffee apple crumble option), but Snog has been put to shame by my new favourite haunt: Samba Swirl. For a university project me and my friends have been exploring a number of London's fashionable "villages", and last Saturday me and Harriet took a trip to Angel, and we were in for a very nice surprise indeed. Samba Swirl has three London outlets and really is quite something. 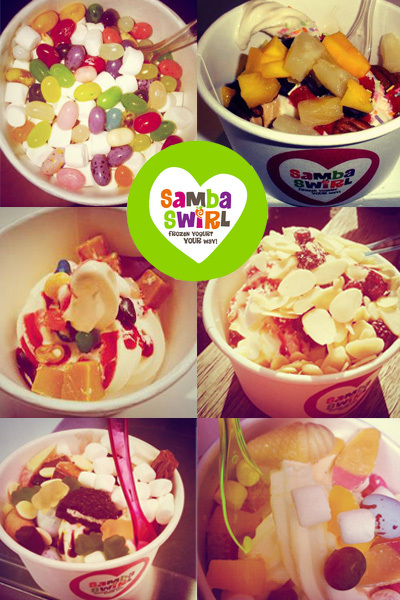 With branches in Chiswick, Clampham and Islington, Samba Swirl is a real treat for Londoners of all ages. It is basically self serve and the price depends on how greedy you are that day, and the flavours vary daily. What makes Samba Swirl trump the competition is their extensive menu of flavours. Their low fat flavours include the creamy swiss chocolate, decadent dulce de leche, indulgent red velvet and- my favourite- Caribbean Coconut. They offer even more non-fat options like cookies'n'cream, cheesecake, praline'n'cream and country vanilla. You can mix and match the daily flavours as you please, but you can always be assured that they will never be more than 170 calories per 100g (less than 140 in 100g non-fat). In essence, it's as healthy as you make it! The help yourself toppings are just too hard to resist. It really is like a sweet shop with all sorts of retro sweets on offer alongside bursting tropical fruits and loads of marshmallows (my cheeky tip to keep the price down- marshmallows are light as air!). You can be all healthy and opt for fruit and nut, or you can embrace your inner pig and pile your pot high with all sorts of treats from snickers pieces to cherry pie filling and mini fudges. It is certainly worth a visit, and will be bustling this summer as people flock to Islington Green to soak up the imminent sunshine. What could be better to cool you down than a mountain of raspberry frozen yogurt, swimming in passion fruit coulis, doused in marshmallows and studded with white choc chips? Your suggestions are welcome, but pointless. I'm a girl obsessed!